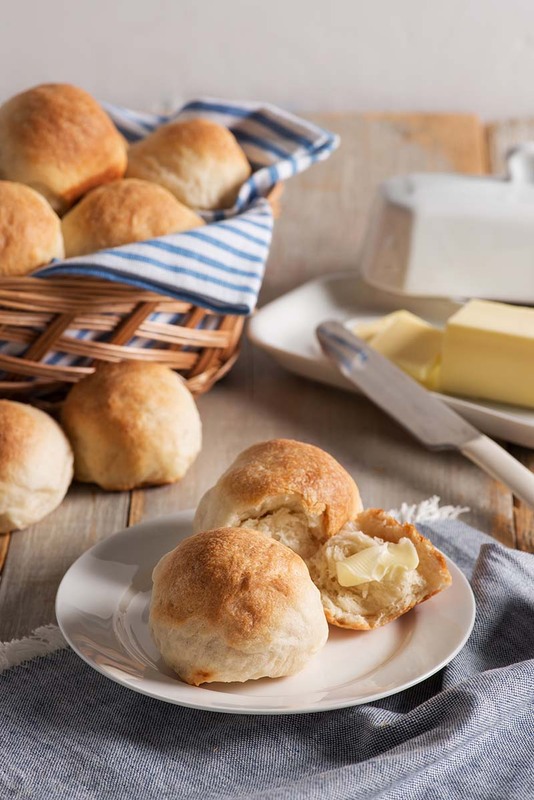 Light and fluffy buttermilk yeast rolls - made from scratch, with love. Serve warm with your favorite every-day dinner or special occasion meal. In large mixing bowl, combine 1 ½ cup flour, yeast, sugar, salt and baking soda; mix well. In saucepan or microwave-safe dish, heat buttermilk, water and shortening/butter until warm (120-130°F; shortening/butter does not need to melt). Add to flour mixture; mix with dough whisk or wooden spoon until blended. Gradually stir in enough remaining flour to make a soft dough. Turn out onto lightly floured surface; knead for about 5 to 8 minutes or until smooth and elastic. Use additional flour if necessary. Place in greased bowl, turning to grease top. Cover; let rise in warm place until light and doubled, about 20-30 minutes. Punch down dough. Divide into 4 equal parts. Divide each fourth into 6 equal pieces. Shape each piece into a smooth ball. Place in greased 15x10-inch jelly roll pan. Cover; let rise in warm place until almost doubled, about 20-30 minutes. Bake at 400°F for 15 to 20 minutes until golden brown. Remove from pan and place on wire rack to cool. I must add that bread flour must be used with this recipe according to tips about baking with Platinum yeast on this web site because bread flour can stand up to the yeast. I am so excited to report that this is the absolute most easiest, the most delicious, most tastiest rolls you will ever eat. I got downright excited seeing just how easy it was to make. And I love the Platinum yeast. I got on to my store cause they were completely out of the yeast. I will find it elsewhere. Thank you so much Red Star. I love you!